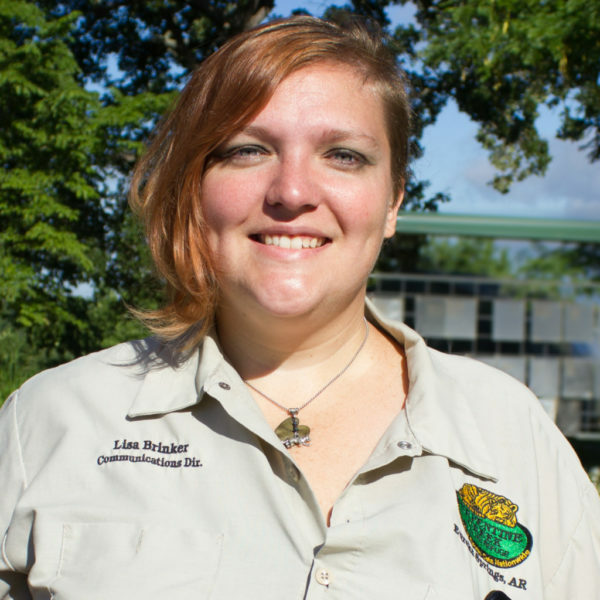 Turpentine Creek’s Communications Director, Lisa Brinker is originally from Denver, Indiana where she had volunteered at what is now a defunct roadside zoo. After having seen what really went on behind the scenes of the facility, Lisa left in complete dismay. Many of the animals were starving and the habitats were falling apart. Upon hearing of their forced closure, she contacted the non-profit Tigers in America (TIA) who helps abandoned, abused, and neglected big cats find sanctuaries. Her hope was that TIA would be able to help her track down the tigers from the zoo in order to see what became of them. One of the sanctuaries they pointed her to was TCWR. While Turpentine Creek did not rescue any of the cats from the roadside zoo, Lisa followed their facebook page closely and when they advertised for the Communications Director position she jumped at the opportunity and applied. With an Associates in General Studies from Colorado Techincal University Online Program, a BA in General Studies from Indiana University Kokomo, and an MA in Public Relations from Full Sail University, Lisa works to create quality content for our supporters to enjoy. She also manages all social media accounts and works with the office team to write and produce the quarterly newsletter. When not working for the big cats, you can find Lisa writing short stories (she even has one published under a pen name in an anthology), working on a few book projects, and painting the big cats she loves!